Parallely with the White Out show by Peeta, opened at the Maxwell Colette Gallery in Chicago, another lettersmith is flaunting his work. 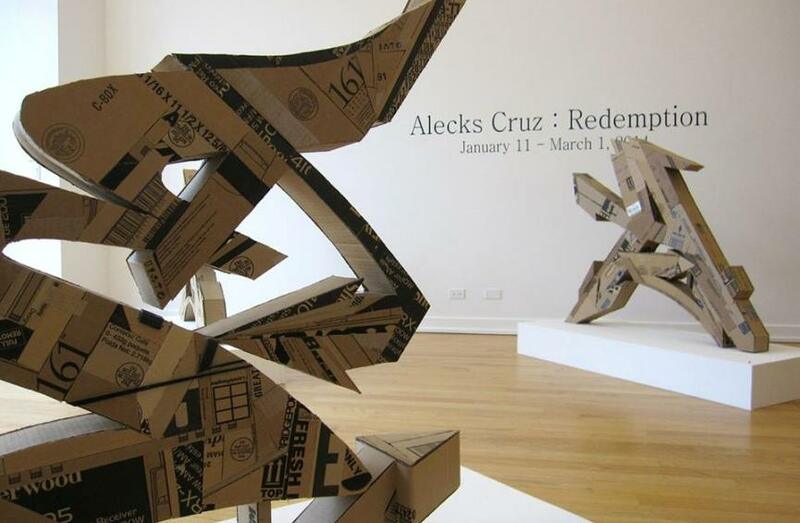 Alecks Cruz presented an exhibition of cardboard sculptures, that emulate letterforms of graffiti at the solo exhibition titled Redemption. The show is still on view, and it will remain so till March 1, 2014, so there is still time to see it. Alecks Cruz comes from the street art realm, and this sculptural exhibition is taking his views on 3D lettering a step further. He delves deep into the structure of the characters, extracting their compositional and aesthetic value onto the surface. 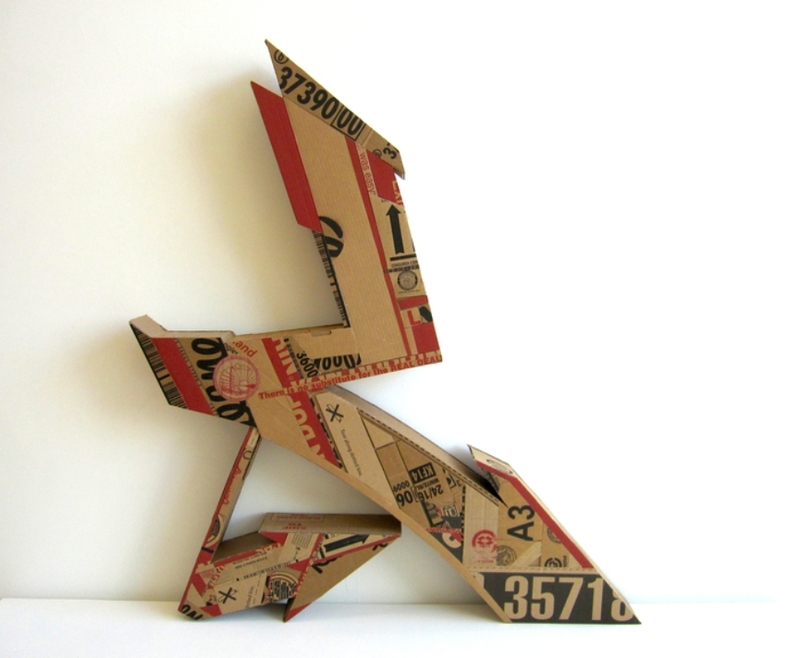 The material in which Cruz creates are recycled cardboard boxes, which allows him to maintain the stability of each sign’s structure. 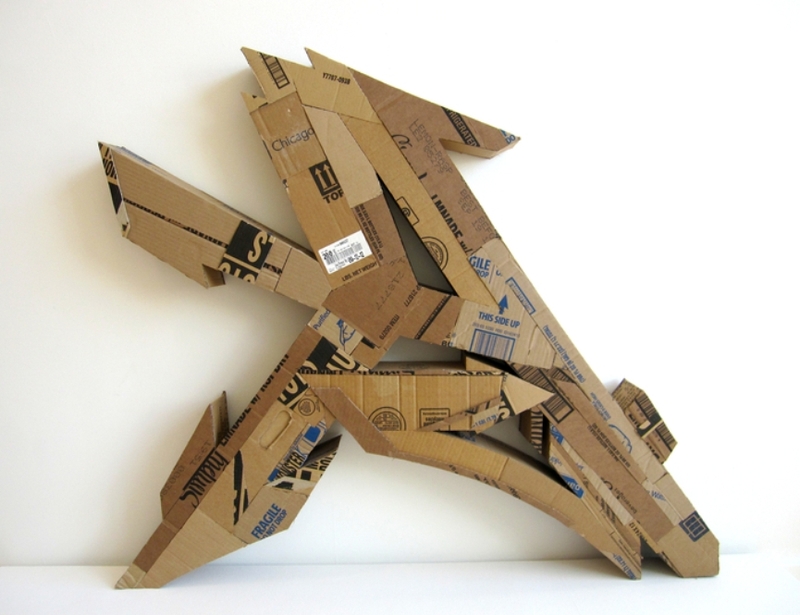 All of the letters are stylized in the wild style of graffiti, and polished with cardboard veneer panels, cut out of the more appealing parts of the boxes. Bringing the letters into existence by giving them a third dimension, Alecks Cruz redefines their true symbolism and conjures tangible artwork meant to be seen from all angles. The absence of paint allows the large characters to interact with the remaining written content of the material they are made of. Redemption exhibit displays six of these lettered sculptures, arranged around the Maxwell Colette space. 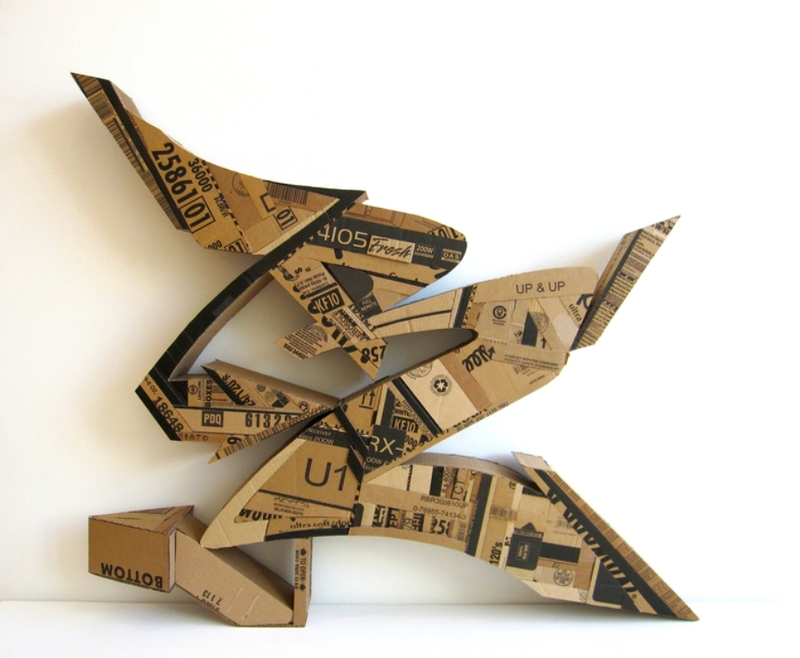 The title for the show was chosen purposefully, as the artist strives to recover old and discarded materials, providing a redemption for them, just as the whole graffiti art has been restituted once it entered the official gallery space. Such a strong standing of the artist compelled him to make an exhibition that would also provide a depiction of his personal viewpoint on the issue of appropriation of graffiti by outside entities. 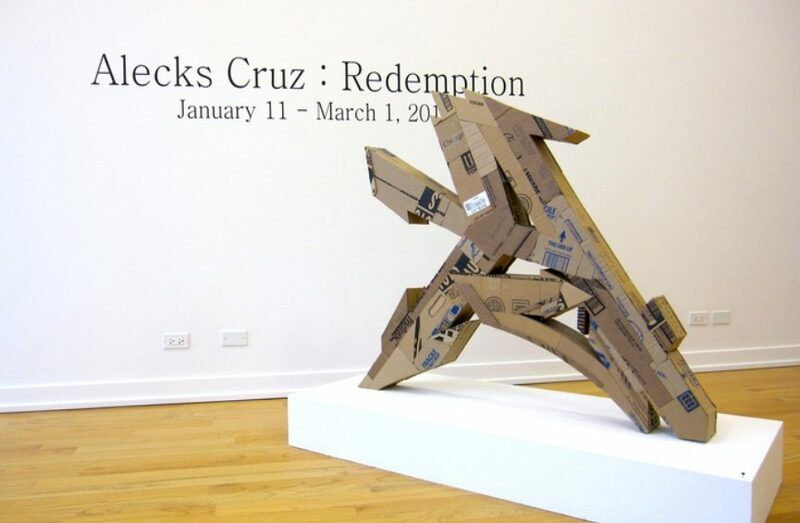 These letters are therefore not solely a simple transposition of graffiti into space, but a metaphor of Alecks Cruz’ personal opinion, making the reclaimed cardboard all that more significant in the conceptual sense. 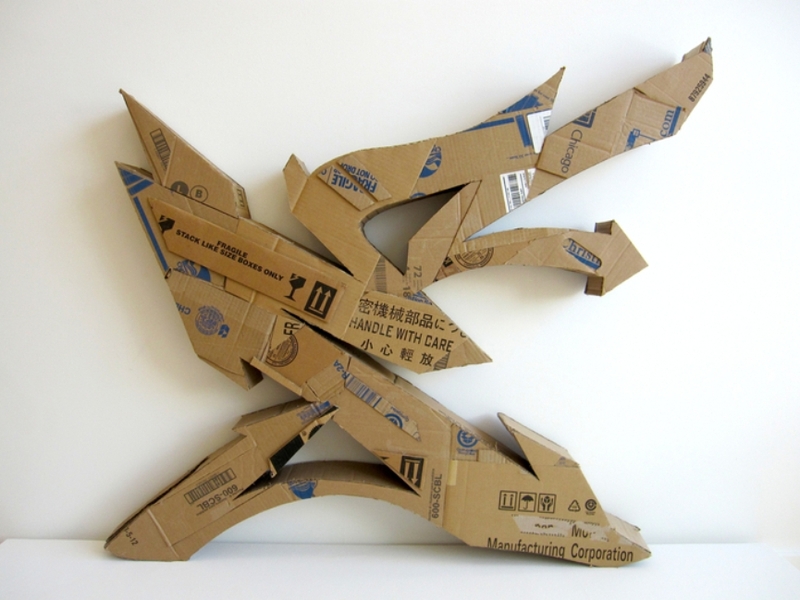 By deconstruction shopping boxes, the artist defies the culture of consumerism, and by assembling them into emblems of freedom, which he sees in graffiti letter forms, he objects the transformation of these beautiful and creative forms into a commercial banality. Born in Chicago in 1984, Alecks Cruz has been active as a graffiti writer making pieces that surpass the two-dimensional world. He commenced working with spray paint, but his search for volume has taken him onto and exploratory journey into the world of sculpture. Currently, he is mostly occupied by his 3D lettering, that is largely off the grid of street art tradition, as its application becomes an issue. Alecks Cruz is a self-taught artist and graphic designer. 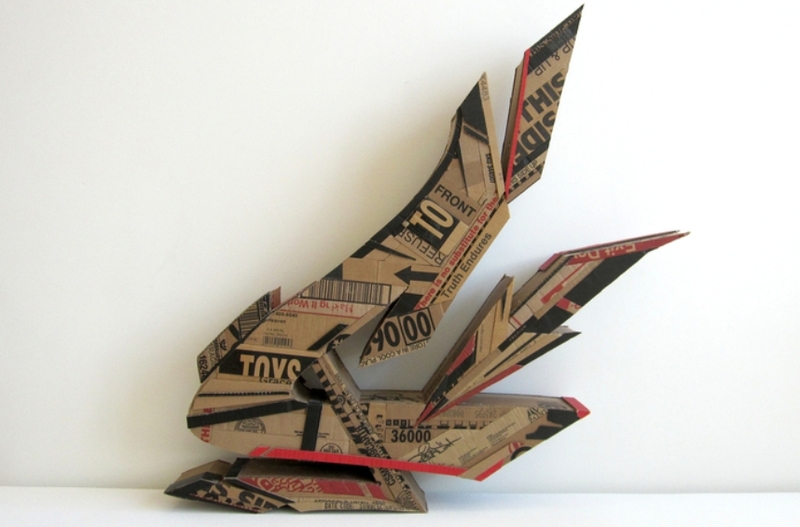 He won the Chicago Cut & Paste Characterized competition in 2013 and an award at 2011 Fringe Festival in Chicago. He lives and creates in Berwyn, Illinois. 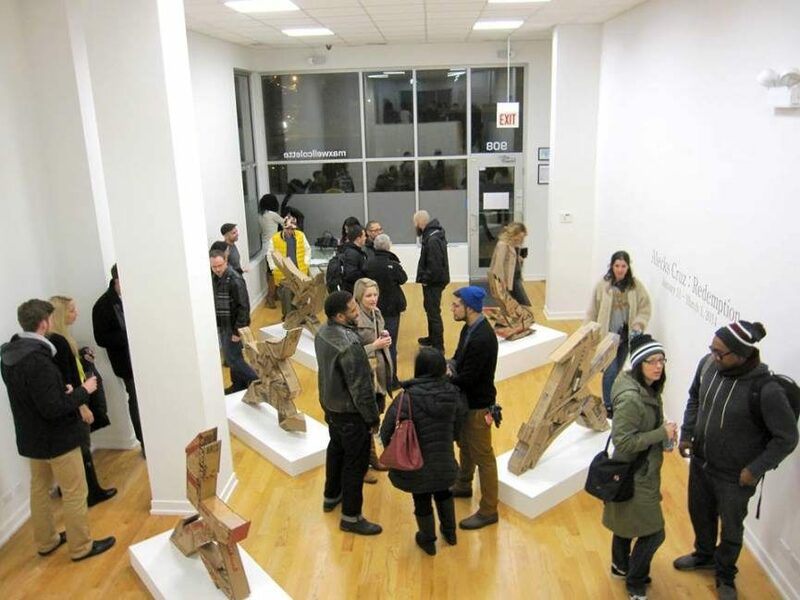 Maxwell Colette Gallery in Chicago is focused on exhibiting what is known as post-street contemporary art. Founded in 2010, the space is dedicated to abolishing all boundaries between fine and street art.